Melbourne celebrates excellent food and offers both unique and social dining experiences. There is just a no better way to savour a gourmet dining experience, surrounded by the vibrancy of this world-class culinary city while cruising on a luxury boat. Enter Melbourne’s first and only Yarra River three-course progressive lunch or dinner cruise which includes a scenic cruise along Melbourne’s iconic Yarra River with spectacular breath-taking views and delicious food and wine to savour your taste buds. Indeed this is an experience not to miss. 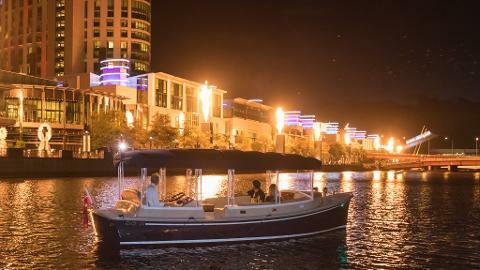 Commencing from Docklands and cruising upriver while having pre-dinner drinks onboard, the first stop off is at the Southwharf for entrée with a glass of wine or beer then we proceed to Southbank for the main course and choice glass of wine or beer. After the main course, we re-board and cruise up to Morell Bridge while enjoying more drinks and taking in the signature views of Melbourne city and then return through the heart of Melbourne enjoying last course –dessert. 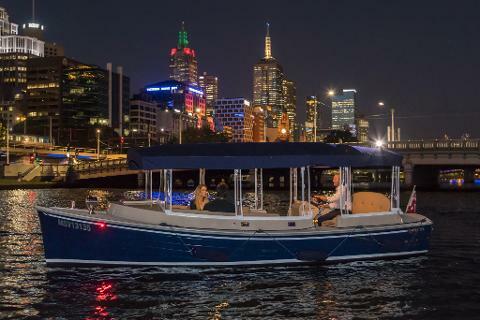 Our Yarra River progressive lunch/dinner cruises are suitable for groups from 2 persons up-to eight persons- although we have the capacity for larger groups up to 35 persons on request. The duration of the cruise is approximately 3.5hrs and is all inclusive of three courses, and all beverages included. For groups larger than 10 please contact us for pricing and options, we have the capability for groups up-to 35.